The signalling contract for the Warsaw – Gdynia railway line was awarded in February 2013. The 350km line between Warsaw and Gdynia will be deployed with the ERTMS signalling system. The new signalling of the Warsaw – Gdynia railway line will be completed in 2015. Trains on the Warsaw – Gdynia section of E-65 can travel at up to 200km/h speeds when the re-signalling is completed. The Warsaw – Gdynia section of E-65 is a busy passenger and freight route passing through 35 stations. The line has been undergoing reconstruction over recent years, including modernisation of the signalling system along the line. The contract for upgrading the signalling system was awarded in February 2013, with re-signalling expected to be complete by 2015. "The Warsaw – Gdynia section of E-65 is a busy passenger and freight route passing through 35 stations. " The current Warsaw – Gdynia line does not allow trains to operate above 120km/h, while the existing infrastructure has deteriorated. It has, therefore, been decided to rehabilitate the existing infrastructure to improve safety and the speed of the line. Upgrade activities involved different tasks, such as the replacement of rails and sleepers, construction of new stations and passenger halts, modernisation of existing stations, construction and modernisation of viaducts and underpasses, reconstruction of level crossings, adjustment of curves, and the reconstruction of the telecommunication and signalling system. The main aim of the reconstruction programme is to adapt the E-65 line as per European Agreements on Main International Railway Lines and the Combined Transport Lines and Related Installations. The total cost of the Warsaw – Gdynia line reconstruction is estimated at €2.7bn ($3.49bn), of which the European Investment Bank provided €400m ($516m). The Warsaw Metro is the rapid transit system of Poland’s capital city Warsaw. It currently has a 22.6km-long single Metro Line 1 running north-south from the southern terminus at Kabaty to Młociny in north. It has 21 stations on the route and is operated by the state owned Metro Warszawskie. 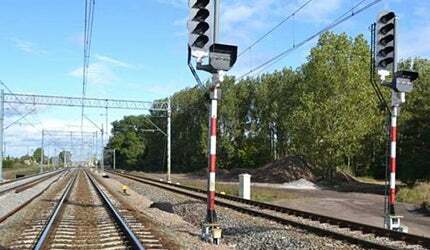 The signalling project comprises the last stage of the upgrade of Warsaw – Gdynia line. The line will be deployed with ERTMS technology, which is a standard compatible signalling technology for trans-European interoperability. The new signalling technology will include an automatic European Train Control System (ETCS) and GSM-R radio system for continuous communication between the driver and the traffic management centre. ETCS Level 2 is being mostly deployed on the line, which does not involve any line-side signals. Train movement is efficiently regulated through the direct communication from a radio block centre to the train with the use of GSM-R. Eight local control centres on the line will, however, be installed with a conventional signalling system but the equipments will be developed to ETCS standard. Once complete, the line will be operated with increased capacity and safety. Trains can travel at a maximum speed of 200km/h on selected stations. The re-signalling contract for the 350km stretch of E-65 was awarded to a consortium formed by Bombardier, Thales and Nokia Siemens Networks. The €112m ($145m) contract was awarded by the Poland’s railway operator PKP at the beginning of 2013. Thales and Bombardier will design and develop the ETCS Level 2 signalling system on the line. "The current Warsaw – Gdynia line does not allow trains to operate above 120km/h." Thales will provide the ETCS Level 2 system to the dispatching centres in Warsaw and Gdynia, as well as an integrated information system for travellers on the line. Bombardier, which has the largest share of €53m ($70m), will provide its INTERFLO 450 ERTMS technology, EBI Com radio block centre and EBI Link balise systems. It will also provide its INTERFLO 200 mainline technology, EBI Screen 300 central traffic control solutions and an EBI Lock 950 computer-based interlocking system for the conventional signalling. Thales and Bombardier Nokia Siemens Networks will provide the GSM-R infrastructure of the signalling project.